I love big bore shotguns. My favorites are the real big ones – the 8 and the 4 gauge side by sides. Unlike boat-mounted punt guns, most of these were made to be shot from the shoulder. They pushed a lot of lead, a long ways, and hunters used them for pass shooting, especially at geese and swans. Heavy, and cumbersome, big bores are specialized tools. Gun makers didn’t turn out many of them, so today you don’t see them often, especially in anything bigger than 8 gauge. That’s one of the things that makes this 4 gauge side-by-side so special. In the last decade, I’ve seen two other 4s (this Reilly was one of them). Both of those were hammergun with damascus barrels. 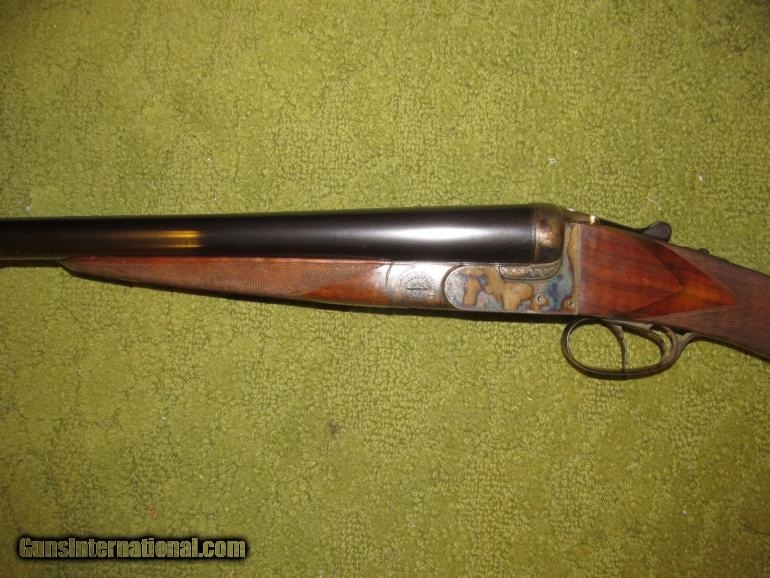 This one is much later shotgun, with 39 1/2″ fluid steel barrels. To me, it looks 100% Belgian. I doubt the seller’s claim that it’s a Francotte, but I suppose it’s a possibility. Regardless, the shotgun is very rare and in excellent original condition. It would be a thrill to shoot — if you could find some 4-gauge ammo for it. « Meet Shot, the well mannered spaniel…. nice. like to have that in the marsh by my side. !however, for 53,000, one could buy a nice marsh ; the baker from july seems the much better deal, and came with a box of ammo! !